The first widely adopted device to encode letters, numbers, and symbols as uniform-length binary sequences was the multiplexed printing telegraph, created in early 1870s by the French inventor Émile Baudot. The telegraph of Baudot revolutionized communications and made his name synonymous with rapid telegraphy. As a result the baud, abbreviated from Baudot, came to be known as the unit of transmission speed. Baudot's clever system of recording data in a perforated tape with one 5-bit channel per character resulted in a recording mechanism that the early computers easily adopted. When the computers of the fifties and sixties needed input/output media (apart from punched cards), the Baudot teleprinters and readers had become fast enough by that time to be a viable alternative. The story began in 1869, when the young 23 years old rural lad Émile Baudot joined the France’s Administration des Postes et des Télégraphes at Chaumont, Haute-Marne, where a whole new interesting world of electricity, telegraphy and mechanics awaited him. Émile was at the lower level, as an apprentice operator, but he soon learned to operate the Morse telegraph, and, which is more important for his future, he was sent to a 4-months course in Paris on the Hughes' telegraph. The printing telegraph of David Edward Hughes was the top technology in the telegraphy at the moment, but it only achieved speeds of about a dozen words per minute, so Baudot decided to improve it (at the end he was able to almost triple the communication speed). In 1872, after a service at the French Army, Baudot returned to the Telegraph Service at the central Post Paris, and was encouraged to develop (on his own time), a system for time-multiplexing several telegraph messages. Baudot realized that in the printing telegraphs of the time the line is idle for most of the time, apart from the brief intervals when a character is transmitted. To produce a complete multiplex system he combined, along with his original ideas, the printing mechanism from Hughes' telegraph, a distributor invented by Bernard Meyer in 1871, and the five-unit code devised by Gauss and Weber. Baudot devised one of the first applications of time-division multiplexing in communications. Using synchronized clockwork-powered switches at the transmitting and receiving ends, he was able to transmit five messages simultaneously and, as the transmissions were received, would print them in ordinary alphabetic characters on a strip of paper. The system was officially adopted by the French Post & Telegraph Administration five years later. In fact, Baudot’s early telegraph used a six-unit code, see the lower figure. 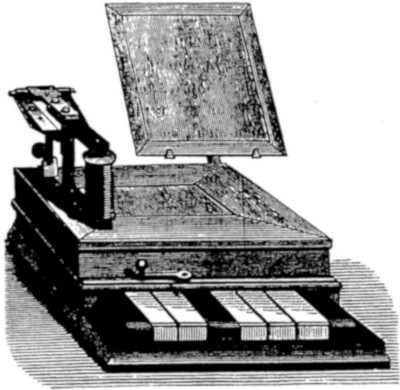 Instead of a variable delay followed by a single-unit pulse, like in Hughes' telegraph, Baudot used a uniform six time units to transmit 26 letters of the Latin. In the figure each printable character is shown next to the pattern of impulses that is transmitted on a telegraph line to represent it. Dots specifically represent the positive voltage of an idle telegraph line and circles the negative voltage of an active line. In related systems using punched paper tape, circles represent a hole punched in the tape and dots the absence of a hole. Baudot received a French patent for his invention (Système de Télégraphe Rapide) on 17 June, 1874 (see Brevet Nr. 130898). A six-unit code can encode 64 (26) different symbols, far more than the twenty-six letters of Latin. 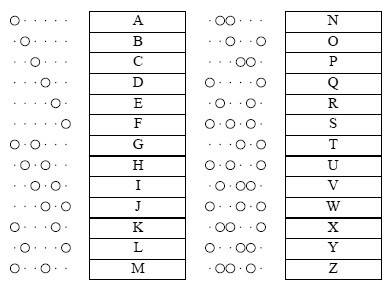 This smaller set of characters can be encoded more efficiently with a five-unit code, which allows 32 (25) combinations, so in 1876 Baudot redesigned his equipment to use a five-unit code. Punctuation and digits were still sometimes needed, though, so he adopted from Hughes the use of two special letter space and figure space characters that would cause the printer to shift between cases at the same time as it advanced the paper without printing. Baudot's hardware had three main parts: the keyboard, the distributor, and a paper tape. The five-unit code of Baudot was structured to suit his keyboard (see the upper figure), which controlled 2 units of each character with switches operated by the left hand and the other 3 units with the right hand. Each operator (there were as many as six) was allocated a single sector of the distributor. Once the keys had been pressed they were locked down until the contacts again passed over the sector connected to that particular keyboard, when the keyboard was unlocked ready for the next character to be entered, with an audible click (cadence signal) to warn the operator. Each keyboard was connected to a set of rotors that opened and closed contacts on the conductive elements fixed called segments. The brushes rotated thanks to an electric motor or a mechanism weights. Accurate operation of the system depended on the distributor at the transmitting end keeping in synchronization with the one at the receiving end, as operators are only sending characters when the contacts passed over their allocated sector. This could be achieved at a speed of 30 words per minute by strictly observing the "cadence" of rhythm of the system when the distributor gave the operator the use of the line. The receiver was also connected to the distributor. The signals from the telegraph line were temporarily stored on a buffer (set of five electromagnets), before being decoded to print the corresponding character on paper tape. The system of Baudot was accepted by the French Telegraph Administration in 1875, with the first tests of his system occurring between Paris and Bordeaux on 12 November 1877. At the end of 1877, the Paris-Rome line, which was some 1700 kilometres, began operating a duplex Baudot system. The Baudot apparatus was shown at the Paris Exposition Universelle in 1878 and won the Exposition's gold medal, as well as bringing his system to worldwide notice. Soon the Baudot telegraph system was employed progressively in France, and then was adopted in other countries: Italy in 1887, the Netherlands in 1895, Switzerland in 1896, then Brazil and Austria in 1897. The British Post Office adopted it in 1897, Germany in 1900, Russia in 1904, Spain in 1906, Belgium in 1909, Argentina in 1912, and Romania in 1913. 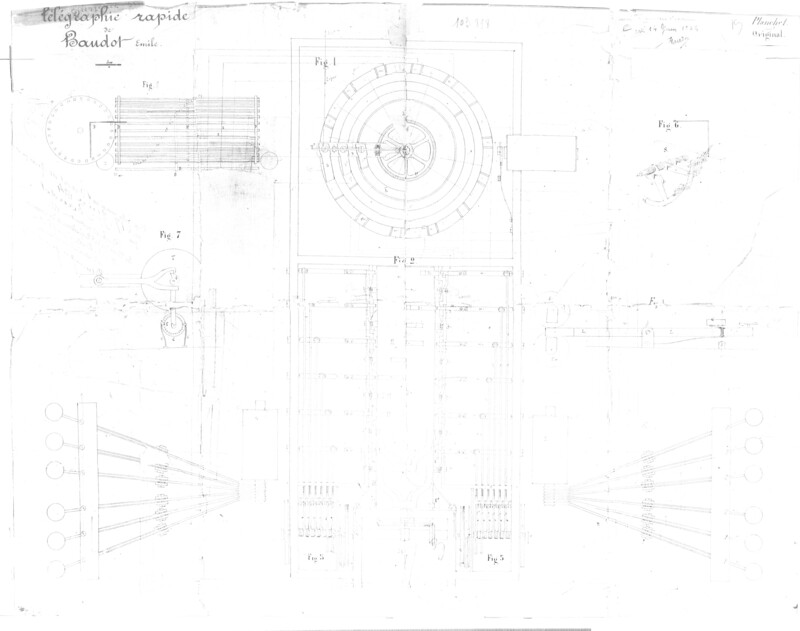 Sadly, little is known about the remarkable engineer and inventor Émile Baudot. Jean Maurice Émile Baudot was born on 11 September 1845, in Magneux, a village in the department of Haute-Marne, in eastern France. 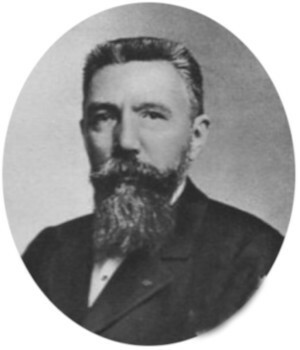 He was the firstborn of Pierre Emile Baudot (8 June 1822–21 February 1895), a shoemaker and the owner of a farm (later in 1890 he became the mayor of Magneux), and Marie Irma Couchot (7 April 1826–10 March 1895), a dressmaker (they married on 30 December 1844). Pierre Emile Baudot was the son of the local landowner Jean Maurice Baudot (1779-1850), and Marie Geneviève Lepaux (1778-1859). Marie Irma Couchot was the daughter of Louis Cochot (1792-1865), a weaver, and Marie Anne Regnaux (1793-1828). The Baudot family was well-off, but Émile didn't have a careless childhood. As a boy, he attended the local primary school and used to work at his father's farm right after, a job he did not particularly like. After the start of his professional career at French Post & Telegraph at Chaumont in 1869, Baudot moved to Paris in 1870 and took 4-moths course to learn how to work with Hughes telegraph. The same year he was appointed a fifth class employee at the Paris Central Station, then at the Bordeaux Station. Baudot served briefly in the army during the Franco-Prussian War of 1870-1871 as a lieutenant, then returned to civilian duties in Paris in 1872. Initially Baudot received little help from the French Telegraph Administration for his system, and often had to fund his own research, even having to sell the gold medal awarded by the 1878 Exposition Universelle in 1880. However, after the first success of his system, Baudot was awarded chevalier de la Légion d'Honneur in 1879 (later in 1898 he was awarded officier de la Légion d’Honneur), then was promoted to Controller of French Telegraph in 1880, and was named Inspector-Engineer in 1882. On 15 January 1890, Baudot married in Bar-le-Duc (a small town in northeastern France, not far from his birthplace) to the young Marie Josephine Adelaide Langrognet (born 4 April 1864), the daughter of a local academy inspector. Unfortunately, she died less than three months later, on 9 April 1890. Baudot suffered from poor health most of his life. Soon after starting work with the telegraph service, he began to suffer physical discomfort and was frequently absent from work for this reason, for as long as a month on one occasion. He died of fatigue on 28 March 1903, at Sceaux, near Paris, at the age of 57.